August 12, 2001, L. & A. Crabo. 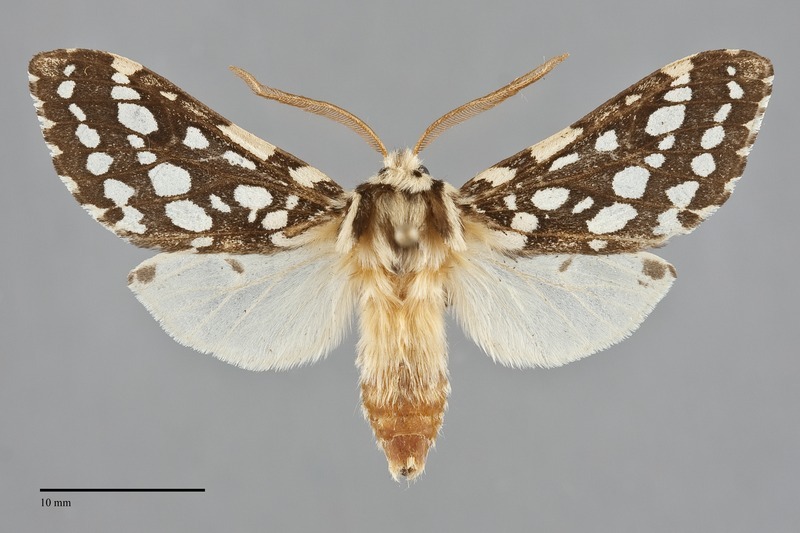 Lophocampa argentata is a medium to large tiger moth (FW length 20 - 26 mm) from forests in the western portion of our region. The forewing ground color is cream with extensive wood brown transverse lines and veins giving the impression of a brown wing with extensive white dots. The hindwing is almost completely cream except for a small brown discal spot and traces of the marginal band at the anterior margin. The head and thorax are cream with brown markings, the latter being most evident along the edges of the tegulae. The abdomen is warmer orange brown, similar in color to the bipectinate antennae. 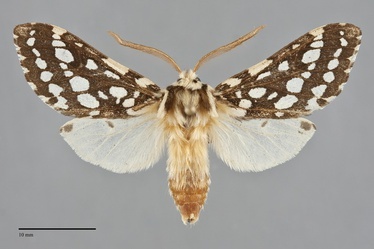 L. argentata is similar in shape and pattern to Lophocampa maculata, but the two species are easily separated because the ground color of the latter species is yellow, not white. Larva is black with long tufts of hair, including dorsal yellow hair tufts and lateral orange hair tufts. It is illustrated by Miller & Hammond (2003). This species is common to abundant in coniferous forests west of the Cascades, and may experience epidemic population explosions. However, it appears to be temperature sensitive, and may not tolerate the colder winter temperatures east of the Cascades. Forest habitats include coastal rainforests, mixed hardwood-conifer forests at low elevations, and higher elevation conifer forests along the west slope of the Cascades. L. argentata is restricted to forests west of the Cascade crest in Oregon and Washington. It is most common in the western portion of British Columbia but has been recorded from the south Selkirk Mountain region. 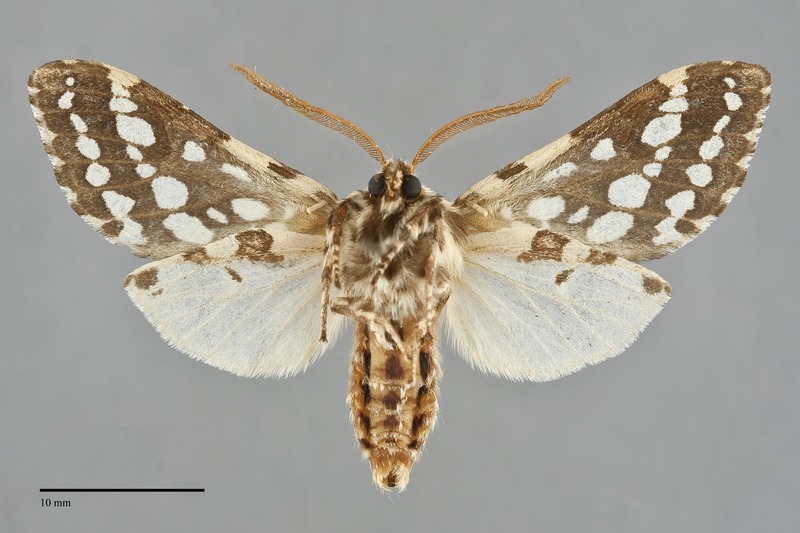 Outside the Pacific Northwest this species occurs extensively in California and eastward in the southwest as far as southern Wyoming and west Texas. This species is a foodplant specialist feeding on conifers (Pinaceae), and particularly favors Sitka spruce (Picea sitchensis) near the ocean, Douglas fir (Pseudotsuga menziesii) within more inland forests, and various pines such as lodgepole pine (Pinus contorta). Adults are single brooded and fly in summer, mostly in July and August. They are nocturnal and come to light.